How can Indonesian people master English if the government and the regulation don't support them to develop their English. The government wants the citizens to speak English fluently but it’s funny that no good atmosphere is given for the progression of it. It’s funny why the government is going to take aside or ignore English at the primary schools. The right thing is that the government should encourage and support fully to English learning at that level not eliminate and ignore it. The government will not give any solution due to the newest policy, the new curriculum will sink Indonesian people. The exact solution is that, the government should recruit professional English teachers in primary schools and give clear curriculum. The case is that on the contrary, the government sporadically cleans English from the primary schools. 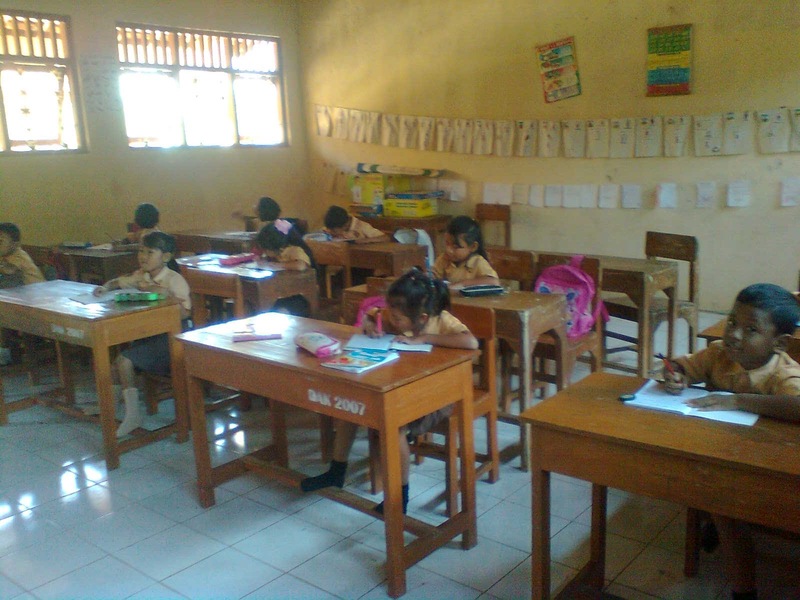 Look at the innocent students of the primary schools(elementary), there are not English teaching learning process anymore, no shout, no singing, no laughter, no dancing, no games, no coloring, no English environment and many things. Of course they will be disappointed, so far they really enjoy with Eglish learning…but one step in the new curriculum, which will be soon implemented, will really remove their joy, their right to be taught English, in fact, they really, really wait and be enthusiastic with English. The government then, has discouraged, English teachers who have been teaching English in elementary schools (primary), they are treated not equally, unfairness, to tell the truth they really have dedicated their selves teaching with no good salary. I say it’s funny again, why the government ignore them, this will lead to jobless for them, how many English teacher in elementary schools who will have no job anymore due to the new curriculum on July 2013. PGRI so far is silent, speakless, PGRI acts as if it never knew what was going on around. It’s funny again, I say many times, A big forum, and institution like PGRI, doesn’t care English teachers, their destiny. There is no solidarity from it, It’s really contradiction with its role, its function, its mission to help all teachers in Indonesia. If I were a member of PGRI, I would be very shy to be,….PGRI only helps and supports civil servant(PNS), but not with the honored teachers like English teachers in elementary schools. In the era of computer, era of sophisticated technology in today’s life, English takes a very important role, but why once again I say, Indonesia, the governmentof Indonesia really takes aside it. English needs to be taught properly earlier. The fact tells that children are easy to gain English skills. Does this need to be stopped, it sounds like we take their rights, their freedom. Wish I could find another article though the sense really same with above context. Just in case, this full of passion to argue but consist only one approach or point of view. Make it more moderate, please. It doesn't mean we ignore you, but just reminding that the style seem transferred from Bahasa to English. Why don't you put some comparative sample with our neighbor thus the content more valuable. Giving accurate information but not directing, as you wanna show up data than telling. Why? Accurate based on fact, that's the technique. Keichi Ohmae already made a statement years gone, global village. Toffler said, new third wave. And, we just wanna deny it, seem rigid option we have. Ups, Booby de Porter, introduce quantum and so on. Ups remind me Anna Hathaway, Dreamed a Dream, Les Miserables. Let the child have one dream. Lastly, please don't check my grammar but message inside. Little bit fool in it. I agree with u almusto. as a teacher of english at elementary school. But what can we do?? There are many smart people but smart to liar! !